I love David Adler‘s creativity, support, drive, ingenuity, and enthusiasm. The first time I met him—at the premier EventCamp in 2010—he immediately purchased my just-published book, sight unseen. The following year, David was kind enough to honor me in his flagship publication BizBash as one of the most innovative event professionals. Whenever I’ve had the pleasure of meeting David (not often enough!) he has proved to be a continual source of great ideas and encouragement, as well as a masterful conversationalist. However, one recurring theme in David’s magazine irritates me, because it perpetuates a common misconception in the events industry. BizBash consistently uses the term “event design” to mean “visual design”. The sixty pages of this issue concentrate exclusively on visual and F&B ideas and treatments. While its article “8 Fresh Faces of Event Design 2016” says it is about “industry newbies who dream up and create an event’s visuals as opposed to those that handle the logistics like a planner”, this really misses the point. Event process design determines the logistics and visuals we use. Logistics and visuals are secondary issues that support the primary design choices we make. First decide what your event is designed to do—what you want to happen during it—and then determine appropriate logistics and visuals that support and enhance the process design. 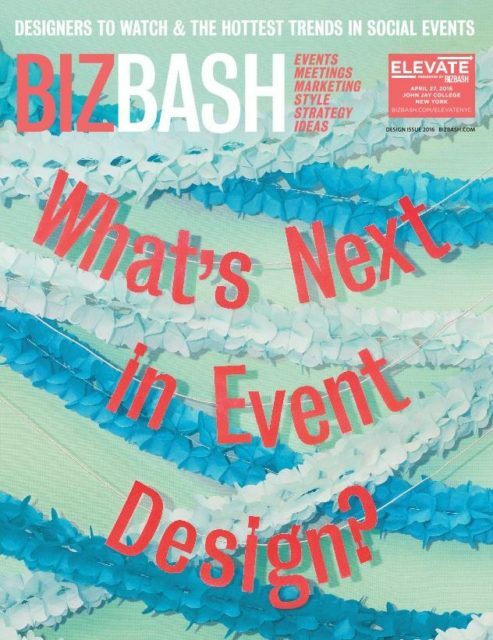 There is nothing in the 2016 BizBash Design Issue that explores the heart of event design: what will happen at the event? As I’ve written elsewhere, we are so steeped in traditional process rituals that society has used for hundreds of years—lectures, weddings, business meetings, galas, shows, etc.—that we don’t question their continued use. These forms are essentially invisible to us and previous generations because they have been at the heart of social and professional culture for so long. In 2009, Jill and Kevin created the JKWeddingDance for their Big Day, and the traditional Western wedding was enriched forever. Eric de Groot and Mike van der Vijver’s book “Into the Heart of Meetings” contains numerous examples of using Elementary Meeting metaphors to discover new congruent meeting forms. Finally, my own contribution. Re-imagining a conference as a participant-driven and participation-rich event, rather than a set of lectures, increases effective learning, participant connection, and individual and organizational change outcomes far above what’s possible at traditional passive broadcast-style meetings. Prolonging the misconception, as BizBash implicitly does, that meeting design is principally about sensory design is slowing the adoption of fundamental and innovative process design improvements that can significantly improve our meetings. Instead, let’s broaden our conceptions of what meeting design is. Our work and industry will be the better for it—and our clients will appreciate the results!